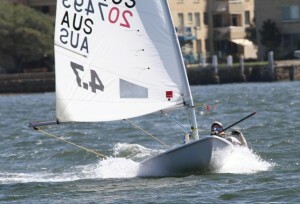 The NSW & ACT Metropolitan Championships were held over the weekend of 17-18th March at Drummoyne Sailing Club. There were 77 entries for the event over the three fleets – 4.7 – 20 entries, Radial – 33 entries, Standard – 24 entries. DBSC’s 4.7 fleet dominated with Daniel Costandi, Jack Ferguson, Sylvie Stannage, Brooke Wilson, Mina Ferguson, and Ryan Littlechild taking home 1st to 6th place in that order. The other highest placed DBSC boats were Jack Littlechild who was 4th in the Radials and Hadrien Bouvely who was 8th in the Full Rigs. Congrats to all who participated.